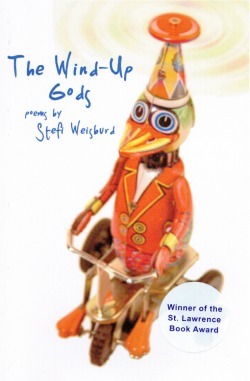 "What a striking pantheon the deities of Stefi Weisburd's The WInd-Up Gods make. It is that rare book unafraid of ambition and ideas, of scope, while never sacrificing emotion, never receding into dead rhetoric. "God what cold star are you" asks one poem and smartly never answers as Newtonian Girl and little gods float about in strange physics and kleptopoets steal words like candy. This book, this poet, will steal you too." 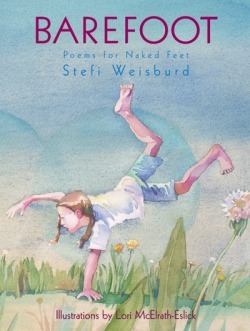 "This quirky collection of 32 poems, all loosely connected by the theme of feet, shows a poet exercising her craft and unique perspectives on familiar experiences. Whether rhymed and metered or free verse, the language pleases the ear. ...[T]his is an appealing book with enough variety to speak to many readers." "The light, breezy watercolor illustrations lend an impressionistic tone and are thoughtful accompaniments to the sunny poems. This collection is ideal for sharing between morning romps in the dewy grass and afternoon strolls on the beach." "What a fun example of a topic that children can explore in concrete ways from multiple perspectives."